Mr. Ludwig Bemelmans’ heroine, Madeline, has numerous adventures. He wrote and illustrated them himself. Children’s classics ever since 1939. 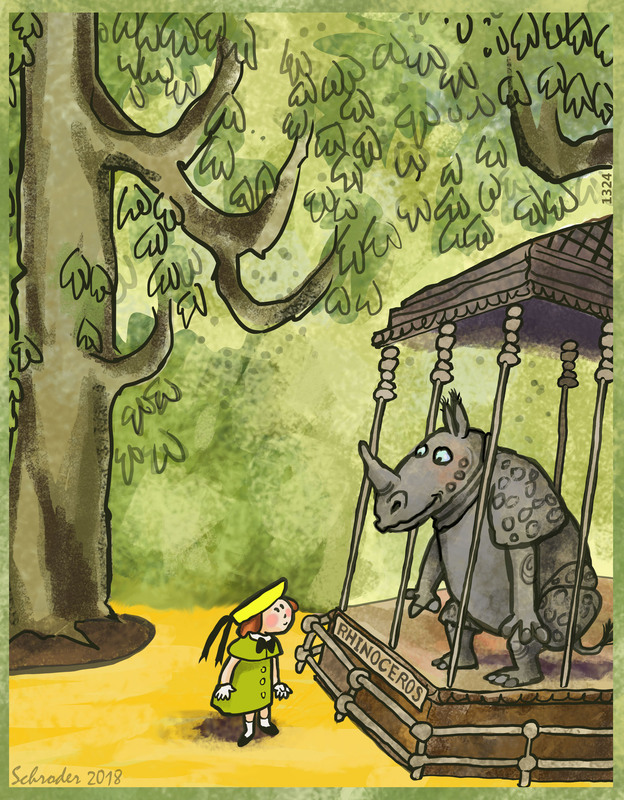 Madeline is popular with young Rhinos because she is full of applesauce and ginger. Among young Rhinos, she has many fans. We have changed a line from Mr. Bemelmans, which in our version now reads: To the Rhino in the zoo, Madeline said, “How do you do?”. You see, being spunky does not preclude civility. Rhinos like respectful exchanges. With all due respect to Mr. Bemelmans for YIR’s attempt to embrace his original work. Thank you. Using other artists’ styles is fun and forces me to examine their technique and priorities. It’s stimulating, which is a big help. YIR has logged in 1,324 post, and that’s a lot of illustrations. Any new angle is welcome. Courtesy is always nicer than the original tiger comment. We love it.